Today, President Obama announced his decision to nominate Loretta Lynch as the replacement for Eric Holder as Attorney General. 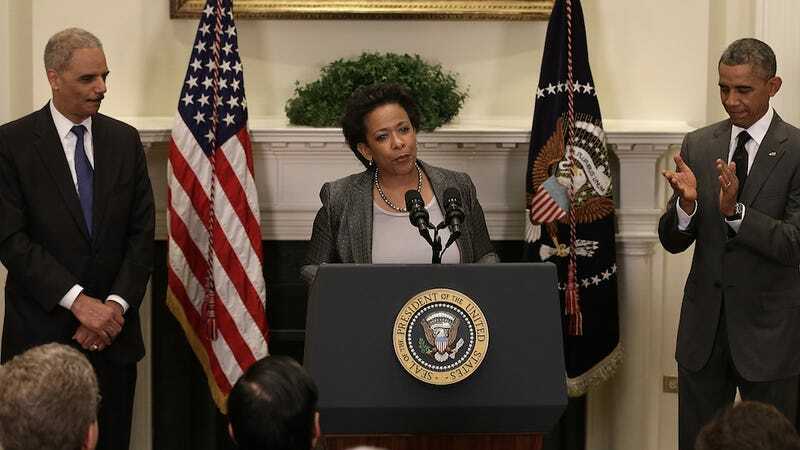 If approved, Lynch will become the first African American woman to be appointed to the position. Lynch has prosecuted "mobsters and drug lords and terrorists, and still has the reputation for being a charming people person," Obama said a news conference in the Roosevelt Room in the White House. "It's pretty hard to be more qualified for this job than Loretta." The president said he hoped the Senate would confirm the nomination "without delay." Lynch is currently the US Attorney for New York's eastern district, covering Brooklyn, Queens, Staten Island, Nassau, and Suffolk. She served as US Attorney twice: she was first appointed by Bill Clinton, serving between 1999 and 2001 and was re-appointed by Barack Obama in 2010. Her appointments were unanimously approved both times. Lynch praised Holder and thanked him for "leading by example and always, always pushing this department to live up to its name," adding that "the Department of Justice is the only cabinet department named for an ideal." She pledged — if she is confirmed — to work with her colleagues "to make that ideal a manifest reality."